16 | TH E M R EP O RT COVER STORY for Mortgage Banking said. "Over the last few years, millennials de- layed jumping into the market, but now are ready. Like past genera- tions, millennials will need financial advice but will receive it in digital as well as traditional forms." To better understand how to- day's consumer interacts with tech- nology, Chase conducted an online survey of 1,014 adults. According to the survey, 72 percent of home- owners don't expect to stay in their homes long-term. Chase suggests that the endless sources of information available through technology are leading homeown- ers to continually look for the next best thing. In addition, Chase found that 68 percent of consum- ers are starting the home buying process on their own. The survey showed that 45 percent of consumers are using a computer or laptop as the first step, while 13 percent use their mobile device. Meanwhile, only 11 percent of Americans first check their local listings in a newspaper or magazine. "Across the industry, I think you can expect to see further innovation with digital enhance - ments to simplify the mort- gage process," Weinbach said. "Customers don't want to place a phone call to ask a question or resolve an issue. Today's con- sumer wants to do most things online and they want an online experience that empowers them to easily track down answers to their questions and complete almost any transaction they need related to their mortgage." Regulators and Lenders Working as One T echnology isn't the only arena where Chase is experiencing rapid change. The regulations governing mortgage banking have seen significant growth since the housing crisis. Executives like Weinbach have had to juggle helping their companies remain profitable, while successfully complying with evolving regulations. Lela Wingard, Chase's Head of Community Reinvestment & Community Partnerships notes that in today's market the focus is on being an accountable and trustworthy lender. 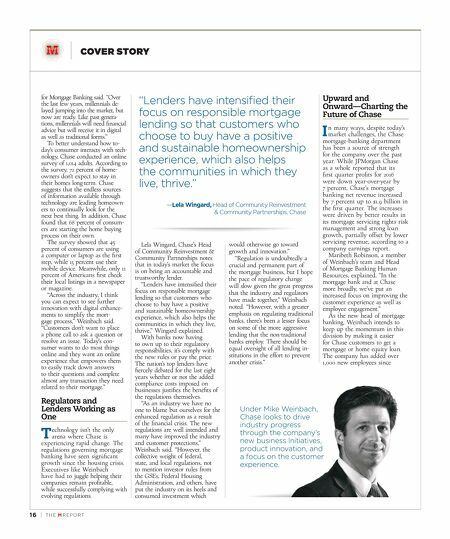 "Lenders have intensified their focus on responsible mortgage lending so that customers who choose to buy have a positive and sustainable homeownership experience, which also helps the communities in which they live, thrive," Wingard explained. With banks now having to own up to their regulatory responsibilities, it's comply with the new rules or pay the price. The nation's top lenders have fiercely debated for the last eight years whether or not the added compliance costs imposed on businesses justifies the benefits of the regulations themselves. "As an industry we have no one to blame but ourselves for the enhanced regulation as a result of the financial crisis. The new regulations are well intended and many have improved the industry and customer protections," Weinbach said. "However, the collective weight of federal, state, and local regulations, not to mention investor rules from the GSEs, Federal Housing Administration, and others, have put the industry on its heels and consumed investment which would otherwise go toward growth and innovation." "Regulation is undoubtedly a crucial and permanent part of the mortgage business, but I hope the pace of regulatory change will slow given the great progress that the industry and regulators have made together," Weinbach noted. "However, with a greater emphasis on regulating traditional banks, there's been a lesser focus on some of the more aggressive lending that the non-traditional banks employ. There should be equal oversight of all lending in - stitutions in the effort to prevent another crisis." Upward and Onward—Charting the Future of Chase I n many ways, despite today's market challenges, the Chase mortgage-banking department has been a source of strength for the company over the past year. 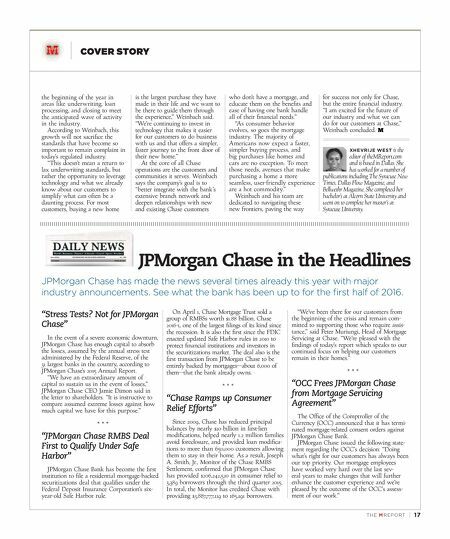 While JPMorgan Chase as a whole reported that its first quarter profits for 2016 were down year-over-year by 7 percent, Chase's mortgage banking net revenue increased by 7 percent up to $1.9 billion in the first quarter. The increases were driven by better results in its mortgage servicing rights risk management and strong loan growth, partially offset by lower servicing revenue, according to a company earnings report. Maribeth Robinson, a member of Weinbach's team and Head of Mortgage Banking Human Resources, explained, "In the mortgage bank and at Chase more broadly, we've put an increased focus on improving the customer experience as well as employee engagement." As the new head of mortgage banking, Weinbach intends to keep up the momentum in this division by making it easier for Chase customers to get a mortgage or home equity loan. The company has added over 1,000 new employees since "Lenders have intensified their focus on responsible mortgage lending so that customers who choose to buy have a positive and sustainable homeownership experience, which also helps the communities in which they live, thrive." —Lela Wingard, Head of Community Reinvestment & Community Partnerships, Chase Under Mike Weinbach, Chase looks to drive industry progress through the company's new business Initiatives, product innovation, and a focus on the customer experience.